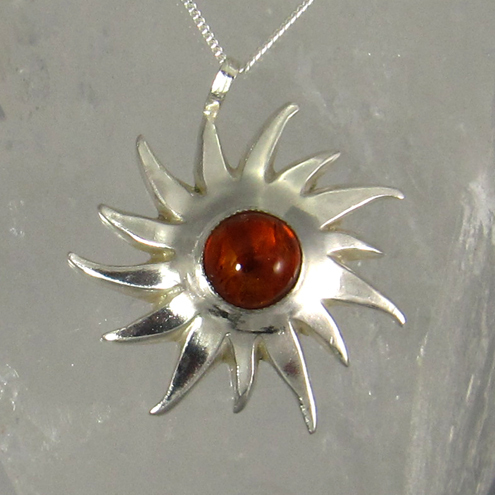 Folksy :: Buy "Warming Silver and Amber Sun Pendant"
Warm up on dark, dreary days and bring sunshine into your life with this striking silver and Amber Sun Pendant. Made from sterling silver, the pendant is embellished with genuine Amber. As a symbol of hope, energy and life, this beautiful Sun has a smooth polished surface that appears to gleam with light. Wavy lines radiate from the centre as sunrays bringing warmth to its surroundings. Folksy :: Buy "Autumnal Sterling Silver and Orange Amber Earrings"
Folksy :: Buy "Silver Set Natural Tiger Agate Pendant with Crystal Bed"
Folksy :: Buy "Silver Sun and Moon Eclipse Pendant"
Folksy :: Buy "Unique Celtic Silver Bird with Jet Black Onyx"